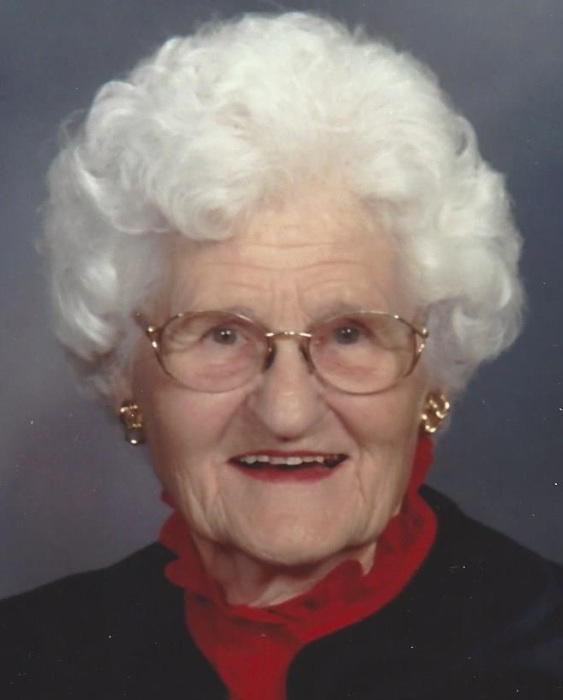 Frances R. McCaw of Viola, Illinois was 18 hours shy of 102 when she passed away on Saturday, January 19, 2019 at Friendship Manor, Rock Island. Visitation is Friday, January 25th from 4:30 p.m. – 7:00 p.m. at Dennison Funeral Home, Viola. Funeral services are 11:00 a.m. on Saturday, January 26th at United Presbyterian Church, Viola with Rev. Matthew Downey officating. Pallbearers are Eric Miller, Andrew Miller, Nathan Miller, Colton Miller, Braden Miller, Jack Ballard, Gavin Shields, Henry Dalton, Logan McCaw, Jake Shields and James Kane. Burial will be in Viola Cemetery. Memorials may be left for Viola United Presbyterian Church, Audubon Society or University of Illinois Home Extension. Frances was born on January 20, 1917 in Oxford Township, Henry County, Illinois the daughter of Thomas Lafayette and Grace Roberts Briggs. Frances was a tom-boy; she showed steers in 4-H and enjoyed bare-back horseback riding. The 1934 graduate of Alpha High School went on to attend Rock Island Business College. After graduating from business college, she worked at Metropolitan Life Insurance Company. On January 24, 1938, she married Fred Ray McCaw at the family home in rural Alpha. They were married until his death in August 1980. The newlyweds lived on a farm west of New Windsor, where they worked for $20 a month. From 1940-1943, they lived and farmed south-west of Aledo… then moved to a farm west of Seaton where they farmed until 1959 when they moved to Viola. After moving to Viola, Frances worked as a legal secretary, with the Warren County State’s Attorney Richard Lamoreaux for two terms then in private practice. She went on to work for Lytton, Lytton and Dalton in East Moline until she retired at age 70. After retirement, Frances and her sisters traveled extensively, visiting Europe, Canada and most of the 50 states. She and her husband had enjoyed an Alaskan cruise too. She had a love of music, in her free-time she enjoyed playing the piano…playing many songs by ear. Frances had a lifelong love of gardening. She was active in her community as a member of the Viola United Presbyterian Church and its Women’s Club, Viola Women’s Club, Audubon Society, HiYa Club of the Rock Island YWCA and was a 50 year member of Home Extension. Those left to cherish her memory are her daughter: Sharon (Jim) Miller of Milan; grandchildren: Trina (James) Kane of Wylie, TX, Mikeala (Ron) Shields of Glendale Heights, IL, Thomas (Rachel) McCaw of Creve Coeur, IL, Valerie (Mike) Breitbach of Rochester, MN, Jennifer (Steve) Ballard of Iowa City, IA, Joseph (Lisa) Miller of Sherrard, IL, Travis Miller of Polk City, IA and Gretta Jo Dalton of Milan, IL; 19 great grandchildren; 1 great great granddaughter; sisters-in-law: Jean Briggs Roberts of Alpha, IL and Marjorie McCaw of Aledo, IL; 19 nieces and nephews and innumerous great nieces and great nephews. She was preceded in death by her parents, husband, son and daughter-in-law: Allen and Judy McCaw, sisters: Ferris Granger, Bliss Lees and Catherine Diggs, brothers: Rex Briggs and Max Briggs and grandson-in-law: Conan Dalton.